There is nothing quite like being caught in traffic and seeing a smog warning flash over the highway’s warning signs. Trapped in your car, you have no choice but to trust your car’s basic filter (if it even has one) as the small particles, combustion gases, and allergens seep into your vehicle. This is a problem for anyone with severe allergies or respiratory conditions. Heck, it’s a problem for anyone who believes breathing car exhaust is a bad idea. Fortunately, you do have a choice. The best car air purifier is actually really, really affordable. And you might already have the necessary equipment in your current car. Short of a few luxury cars few modern autos offer HEPA in-cabin air filters. Lucky for those of us who cannot afford a Tesla (or even the price the Telsa’s BioWeapn Defense option), Bosch makes HEPA replacement filters. These filters are very effective, incredibly affordable, and there’s a part number for almost every newer car model. After learning about (and eventually testing) the Bosch replacement filters we think it’s a shame that every car on the road is not equipped with one from the factory. Maybe the slight increase in price isn’t favorable to the bean counters at Toyota, Fiat, and the rest of the bunch. Maybe they’re worried about the one flaw with these filters. They do a pretty good job of restricting airflow in your car’s HVAC system. But, to be honest we’d go for less air from the vents if it means we aren’t being blasted with pollution. If you endure a long commute filled with stop and go traffic; you need a good in-cabin purifier. And, we haven’t found anything under a hundred bucks that comes close to these filters from Bosch. If you can’t find a Bosch HEPA filter for your car… this is by far the next best option. It’s also a good option if you’re battling odor on your commute. 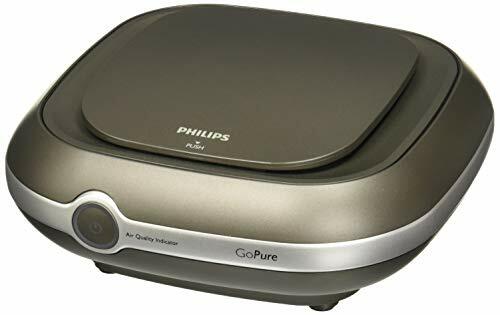 We highly recommend this model (or one from the Philips GoPure line) for anyone with kids, pets, or an addiction to fast food (why does food smell have to linger so long?). The biggest shortcoming is the price… they are kind of expensive. But, products that work typically cost you a good chunk of change. Sure you can get the Bosch on the cheap… but that’s just a HEPA filter element. The GoPure is a stand alone appliance. We think it’s worth it, especially compared to the gimmicky ionizers we’ll cover below. If you cannot afford the GoPure… and the Bosch filters do not fit your car there are some GoPure knockoffs. We haven’t tested one yet, but if you click on the “Check Current Price” link above some of them will show up as alternatives on Amazon. If you get one we’d love to hear what you think. Car air purifiers designed to plug into a 12V/cigarette lighter port are available to suit any vehicle, and they are designed to provide the same great air as an air purifier would in your home. Realize, however, that such a purifier will not be as effective as a larger machine. They’re much much smaller and you just don’t have the room in your car for a purifier that would effectively remove smoke or other ultra heavy contaminants. They do however help protect you from pollutants you encounter on the open road. Especially fine dust and harmful PM2.5 and PM10 contaminants. Due to limited space, many “car air purifiers” do not use filters at all and rely solely on ionizers to remove particles from the air. Technically speaking Ionizers do work, but most of the ones they sell for cars are complete junk. We’ve seen so many sites that rank well in Google search results recommend these terrible little “purifiers.” They don’t work, some are downright dangerous, and you can get a Bosch HEPA replacement for about the same price… or maybe less. As if ozone and not working are bad enough things to make you think twice… there are other problems. When an ionizer does work, heavy use of ionizers can result in black wall effect, the gradual darkening of surrounding materials as the particles influenced by the ionizer attach to neutral surfaces. That’s why purifiers that use ionizers also have an actual filter to trap the clustered particles. We think you should avoid plug-in ionizers, but they are pretty popular. So we’ll cover them below. However, if you can afford something better that provides mechanical filtration… get that. 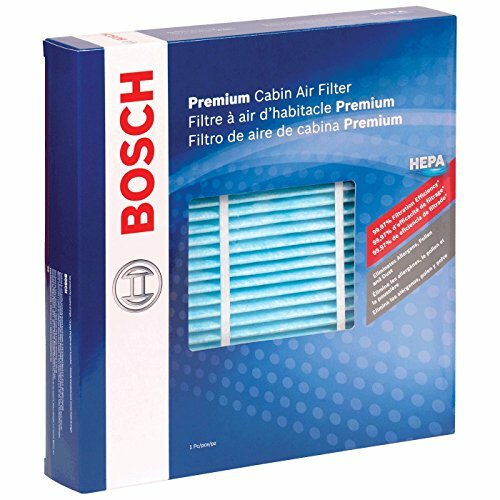 If your car accepts a Bosch HEPA replacement filter… definitely get one. But, if you’re sold on the idea of a junky little plug-in ionizer keep reading. This product fits into any 12V socket and features a sleek design with LED lighting to enhance the interior of your car. The manufacturer claims that it is capable of removing up to 99% of pollutants, allergens, smoke, etc. from the cabin of your vehicle. And that the built-in ionizer uses safe amounts of ozone to destroy viruses and bacteria. This purifier has won consistently high praise, and former buyers have even used portable 12V sockets to run the ionizer in other spaces. It performs particularly well against cigarette smoke, which is a notoriously difficult odor to combat. Users compared it to other brands they have tried, pointing out that the O-Zone stays in place very well, while previously used products could come loose during drives. 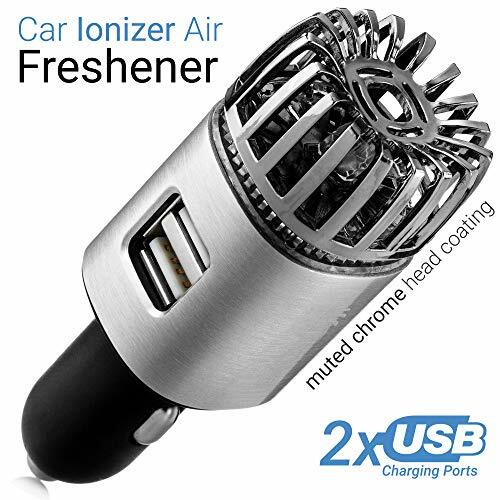 The product also apparently handles pet dander and smog very well, and seasoned drivers complimented the fresh smell left in their cars. Compact and sleek, this air purifier is designed for both automobiles and RVs, which suggests a good range. The manufacturer recommends this product for those who suffer from allergies. They also say its good for those who are especially susceptible to pollutants, such as small children. The manufacturer provides a 30-day money back guarantee to ensure customers are satisfied with their product. If you buy one… be ready to use it. This model has no filters, which means no replacement costs, and it has been designed to improve flaws in previous models. If you’re still think that you want one of these ionizers… ask yourself this. “Where do the pollutants go after they’re ionized?” This product runs “silently,” without the buzzing common in other models. This is also a great way to tell that something doesn’t work. In addition to rapidly clearing smoke, the ionizer has proven effective at easing the symptoms of allergy-sufferers while they drive. The neutral design and blue LED also blended well with most interiors without causing a distraction for drivers. This product claims to have the most powerful ionizer on the market, capable of killing viruses, bacteria, and mold. The manufacturer goes on to claim that the ionizer can handle everything from car exhaust to formaldehyde fumes. The product description even suggests the ionizer can boost metabolism. A air purifier that helps you avoid trips to the Gym!?! Awesome! Sign us up for five. Wait… that sounds like BS. If you think a car air ionizer is going to help with your waistline; please drive straight to the nearest DMV and surrender your driver’s license. 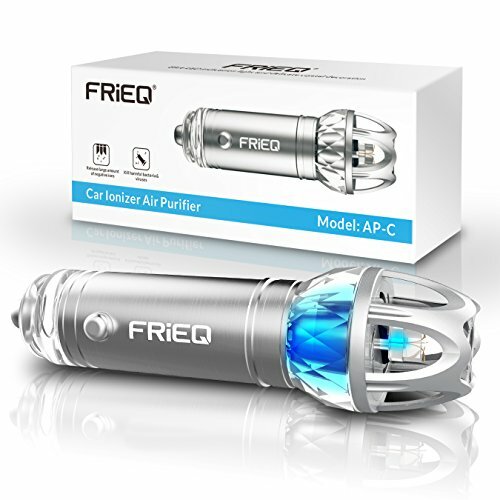 This air purifier fits any 12V socket and is designed to complement the interior of most cars. So maybe it does have one redeeming factor. The ability to remove smoke, pet dander, and dust that aggravated sinus conditions is a plus sentiment from previous users. The ionizer also seems to do a good job cleaning the smell of leftover food, dust, and body odor. If you are going to invest in an air purifier for your car, don’t waste time or money buying an ionizer. Rather than forcing air through various stages of filtration, these devices will simply flood the cabin of your vehicle with positive or negative ions. When it works these clusters will then bond with the nearest neutral surface. Basically making your car dirtier. You also need to understand that Ozone is an irritant and when used improperly (near living breathing creatures) it can be pretty dangerous. The only time we recommend using an ozone generator in a car is when it needs serious odor removal… And, you need to park the car for days and let the ozone dissipate before you drive it. If you want a real purifier make sure it has (or uses) a fan to move air through a filter. The Bosch filters we mentioned first work incredibly well. And they’re as cheap as the crappy ionizers you might be considering. Do yourself a favor and see if Bosch makes one for your vehicle. If they don’t; save up you money and get something like the Philips GoPure.